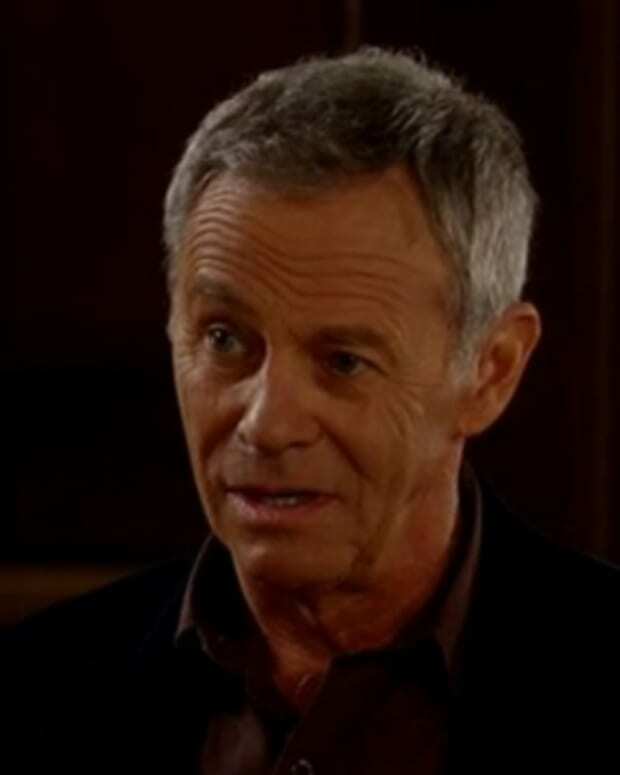 Perkie's Observations: Sonny UNLEASHES on a Reporter on General Hospital! Sabrina tells Patrick about Britt’s delivery and that Brad took off, but Nik stuck around. Sabrina understands Patrick can’t shut off his feelings for the baby. Patrick says he fell in love with the idea of another child. Sabrina wants him to focus on the two of them and Emma and be thankful for what is. Nikolas brings the baby to see Britt. She thanks him for everything he did to help her through the delivery. Nik goes to hand over the baby, but Britt decides she doesn’t want him. Nik asks why she doesn’t want to bond with her son. Britt feels she’ll be a terrible mother, like her own. Nik points out they aren’t their parents. Britt persists, so Nikolas takes the baby back to the nursery. Anna stops by to see Maxie and sees the gift Lante gave her. Maxie says she can’t make herself open it because it makes it all final. She’ll really have to say goodbye to the baby. Anna understands. She had to leave Robin behind as a baby, because of her dangerous lifestyle. Anna promises Maxie will feel better. Maxie wishes she was as strong as Robin was. Anna declares she is. Anna tells Maxie about Britt giving birth and the baby not being Patrick’s. Olivia hides the daily newspaper from Sonny since the headline is AJ pleading not guilty to Connie&apos;s murder. Sonny claims he’s sorry for what he put everyone through. Olivia tells him they need to discuss funeral arrangements. Monica finds AJ behind bars and begs him to tell her he didn’t kill Connie. AJ admits he doesn’t remember anything because he was drunk. Monica is livid, saying she risked everything for him. AJ claims he isn&apos;t as strong as she is. Monica says he should never have turned to the bottle and wonders how Michael will deal with this. Michael arrives and tells his grandmother he&apos;s standing by AJ. Dante tells Lulu what happened with Sonny and how scared and angry he was with his father. Lulu tells him they can’t take the baby home until they think of a name. Anna stops by with a gift and coos over the baby. Maxie goes to Britt and asks for her silence. She tells her Spinelli knows the truth, but Lulu and Dante don’t. Britt promises not to say anything. She informs Maxie she told Patrick the truth because he threatened to take the baby. She realized she’d grown to love her son. Maxie wonders where the baby is. She says she gave her baby away because it would have been worst for Lante to lose her. Michael wants to find a way to get AJ out of jail. AJ admits Diane will try to pin the murder on Sonny. Sonny was furious with Connie and left the scene. This upsets Michael, who explains Sonny tried to kill himself. AJ says Diane only wants to plant reasonable doubt, but Michael wants Diane to stop. Sonny opens his front door to find reporters asking his opinion about AJ pleading not guilty and Diane claiming he’s the killer. Sonny gets angry and punches the reporter. Olivia pulls him off. A furious Sonny vows AJ won&apos;t get away with this. Patrick runs into Nikolas, who is holding Britt&apos;s baby. He notes he doesn&apos;t look like Brad. Patrick admits he’s still getting used to the idea the baby isn’t his. Nikolas understands, having been in the same position with Aiden. He says he turned his focus on Spencer and appreciated what he had. A board member calls Monica in and tells her AJ’s arrest is a distraction and has negatively impacted on the hospital. He asks Monica to step down as chief of staff. Britt asks Nikolas to bring the baby back to her room. She takes the child into her arms and bonds. Patrick tells Sabrina she was right. They need to focus on what they have. Lulu and Dante stop by to see Sonny. Lulu hands the baby to Sonny. When Olivia asks about the name, they say they named her Connie.